Obituary – Brand, Lila Kay (Zavodny) « Perry High School Alumni Association, Inc.
﻿Red Hots 64-65, Cheerleader 64-65, Band 61-63, F. T. A. 64-65, Math Club 63-65, Student Council 63-64, Student Council Sec. 63-64, Junior Rotarian 64-65, Home Room Treas. 62-63, Home Ec. Assembly 63-64, Honor Society 62-65, Eng. Assembly 62-63, “Most Likely to Succeed” ’65-’65. Lila Kay Brand, 53, New York, NY, formerly of Sand Springs, OK, was born April 10, 1947. Her parents were Joseph James and Katie Katherine (Mickish) Zavodny. She died Thursday, March 8, 2001 in Detroit, MI while on a business trip. 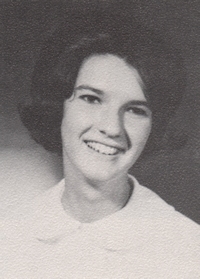 She was a 1965 graduate of Perry High School, Perry, OK and earned a Business Administration degree from Oklahoma State University at Stillwater, OK in 1969. On September 3, 1967, she and Raymond Keith Brand were married in the First Christian Church at Perry, OK. She was employed as a Loan Officer with the Small Business Administration. Funeral will be at 10 a.m., Tuesday, March 13, 2001 at the First Christian Church in Perry, OK. Burial will be in Grace Hill Cemetery, Perry, OK under the direction of Brown-Sisson Funeral Home. Memorial may be made to the American Heart Association or the American Diabetes Association. Her husband, parents and 1 brother, Jimmie preceded her in death. Survivors are 1 son, Adam Anthony Brand, Raleigh, NC; 1 daughter, Amanda Beth Brand, New York, NY; 3 brothers and sisters-in-law, David and Nancy Zavodny, Perry, OK, Eugene and Laural Zavodny, Tulsa, OK, and Alfred Ted and Ester Zavodny, San Diego, CA; 2 sisters and brothers-in-law, Linda and Kenneth Bo Kesner, Cleveland, OK and Cheryl and Doug Butler, Arlington, VA; 1 brother-in-law, Ted Brand and his wife, Janet, Perry, OK; and numerous nieces and nephews.